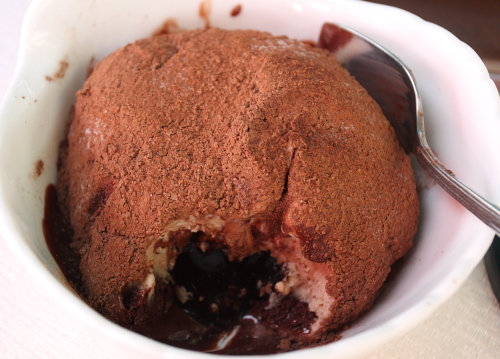 Here is the second recipe that we prepared during the culinary tour. When the tour group went foraging in La Sila mountains near Camigliatello, we found a distinctive type of mushroom called macrolepiota procera, which is known as mazza di tamburo in Italian and “parasol mushroom” in English. Here is a picture of one that I found on that day. I was not familiar with this mushroom, but our mycologist guide told us that this one was edible and to pick them all. 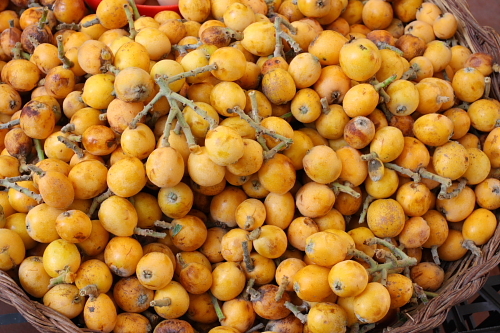 It comes in various sizes; when they are small they have a tight cap but as they age the cap opens up and looks like an umbrella. And let me reiterate the warning I've given in previous posts: please, please, PLEASE, don’t pick mushrooms unless you are trained to identify them or are with a mycologist. Some wild mushrooms are poisonous and can lead to severe illness or death. I went to my grocery store to look for a similar mushroom and the closest I could come up with were portobellos and shiitakes. I used them for this recipe and both worked well. Like the recipe of mushroom and potato soup in the previous post it is very simple and easy to prepare. The filling has fresh ricotta, breadcrumbs, pecorino cheese, and fresh herbs. Mix all the ingredients well. Add salt and pepper. I typically clean mushrooms with only a damp cloth or small toothbrush to avoid getting them wet. But for this recipes Chef Pietro Lecce of La Tavernetta washed the mushrooms. He explained that he actually wanted some moisture, which would help in cooking the mushrooms. I rinsed the mushroom caps and drained them completely, so whatever was absorbed was a small amount of water. 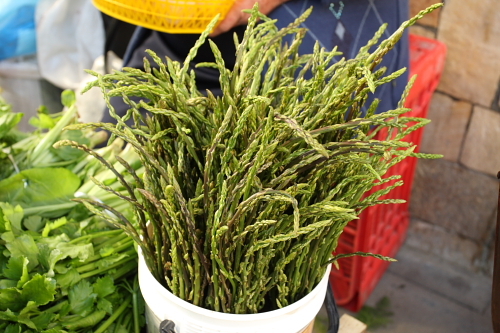 Remove the stems and sprinkle with some salt. Stuff the mushroom caps with about two tablespoons of ricotta filling, less if you're using small cap. Oil a baking dish and place the stuffed mushroom caps next to each other. Drizzle with olive oil. And bake. 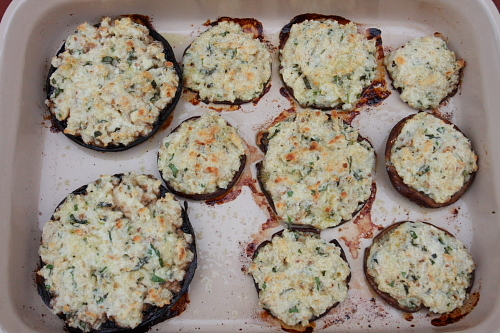 We had these stuffed mushrooms warm as an appetizer but they work well as a side dish also. Give it a try! Remove stems from mushrooms and quickly rinse under water. Drain well. Set aside. Mix the remaining ingredients until all blended. Coat a baking dish with some olive oil. Sprinkle the mushroom caps with salt. Stuff each cap with one to two tablespoons of ricotta filling, depending on size. Place the stuffed mushroom caps inside the baking dish right next to each other. Drizzle with olive oil. Bake at 400 F for 20 minutes for large caps, 15 minutes for small caps. Lots of things have kept me busy since I came back from my culinary tour in Calabria: my book launch happened last week and there is a book signing event every week from now until January. But I did promise everyone in the tour group that I would remake the dishes we cooked in Calabria and give them the recipes. So today, our first rainy day in the Bay Area, seems like a good time to start. Luckily most of the recipes that we cooked are in my book, but a few were new to me. The first cooking class of the tour was held at La Tavernetta restaurant in Camigliatello Silano, in the heart of the Sila mountains. This restaurant is one of the top restaurants in Calabria and its menu focuses on dishes based on local ingredients. We spent our first day foraging for wild mushrooms and for dinner, the chef and owner Pietro Lecce demonstrated two wonderful dishes using them. This week I will give you the recipe for the soup we had. Next week I will try the appetizer we made, roasted mushroom caps filled with ricotta and herbs. This soup really showcases the simplicity of Calabrian cooking. 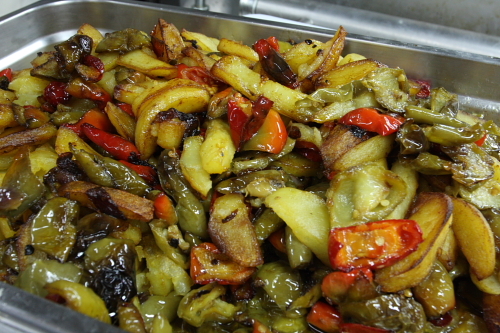 We used the local potatoes that grow in the Sila mountains--our closest are the Yukon gold--and porcini mushrooms. The two star ingredients of this soup, porcini and potatoes. When the potatoes are soft add the sauteed mushrooms and finish the soup following the recipe below. Yummy! In a small pot, warm up three tablespoons of olive oil. Add the cubed potatoes. Stir to coat and then add two cups of hot vegetable broth. Simmer until the potatoes are cooked and soft, about 20 minutes. In the meantime, cut the porcini mushrooms into small cubes including the stems. In a 10 inch skillet place 4 tablespoons of olive oil. Set over high heat add the mushrooms and a sprig of thyme . Add more olive oil if dry. Saute quickly until the mushrooms are soft. Add salt and pepper to taste. Remove from heat. Once the potatoes are soft stir and press against the side of the pot to smash some of them. Add the mushrooms to the potatoes and another ladle of broth. Let them cook together until the potatoes are soft enough that some start breaking apart, about 5 minutes. 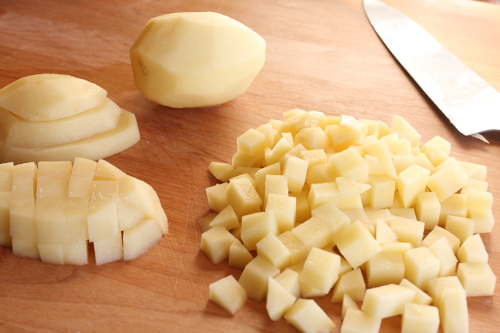 Stir and smash enough potatoes against the side of the potto make a thick creamy soup. Add more broth if the soup is too thick. To serve, place a couple of ladles of the soup in a bowl and add a swirl of extra virgin olive oil. Add a few croutons on top of the soup, if desired. Our trip will start up in the Sila mountains where we will hunt in the woods for wild porcini mushrooms and prepare a dinner with the chef of one of my favorite restaurants, La Tavernetta. We will travel across Calabria to the Ionian coast and spend the next two nights at a beautifully restored farmhouse, Fattoria il Borghetto, and learn how to prepare some of the local fare. Next, a visit to the wine country of Ciro to spend the afternoon on the Dattilo estate to taste the owner's wines and organic extra virgin olive oil. The evening will conclude with a dinner at the estate restaurant, one of the best in Calabria. 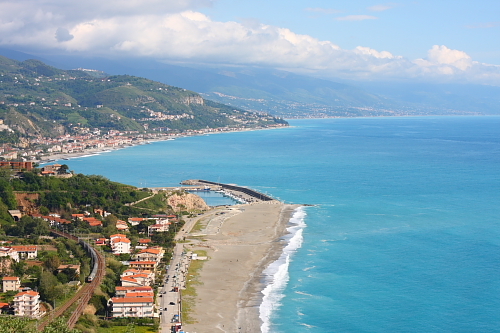 Along the coast we will stop in Rossano and visit the Amarelli’s factory, world-famous for its liquorice. We then move to the Tyrrhenian coast and have another cooking class while staying at the Grand Hotel San Michele near Cetraro. We will visit one of my favorite towns, Diamante, also known for its murals. Here we will taste various foods made with Calabria's famous peperoncino and cedro and feast on a dinner based on local seafood. We will then head south and eat the famous tartufo di Pizzo ice cream. We will have a home-cooked dinner prepared by Signora Callipo herself at Casa Janca and spend the last two nights at a famous five-star hotel, the Hotel Porto Pirgos near Tropea. Our adventure concludes with a cooking class in this area where we will enjoy the famous red onions of Tropea, ‘nduja di Spilinga, and pecorino di Monte Poro. 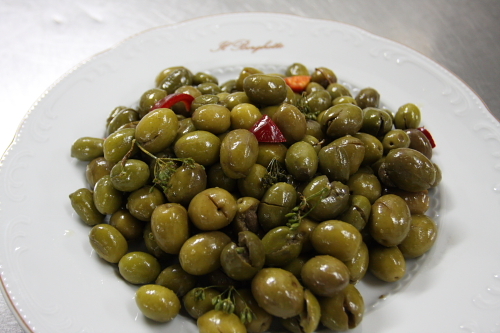 Join me on this culinary odyssey to my native region of Calabria. To find out more details and reserve a spot, click on the Culinary Tour link.